In September 2015, the United Nations General Assembly adopted a set of 17 Sustainable Development Goals (SDGs), which include Target 12.3's call for halving food waste and reducing food losses worldwide by 2030. One-third of all food produced each year in the world is never eaten, while at the same time nearly 800 million people go hungry. This situation urges us to take immediate resolutions and steps towards reduction of food waste and food loss. This cannot be done by one person or overnight. This requires systematic analysis in various layers and collective and appropriate effort. This target can be achieved altogether by various sectors including government organizations; non-government organizations; and private companies in collaboration with schools; colleges; universities; research institutes; religion-based organizations such as temples, churches, etc. ; and charity-based organizations. 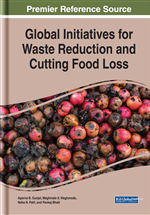 This book chapter will discuss the various steps that can possibly be adopted and implemented to address the serious issue of reduction of food waste and food loss. Food loss and waste occurs in harvesting, storage, packing, transport, infrastructure or market / price mechanisms, as well as institutional and legal frameworks. Food waste starts in the farms. Planting more than the demands, food not harvested due to weather, price of production, transportation costs, labor shortages, etc. About 8% of fish caught in the world’s fisheries are discarded. It is about 7.3 million tons per year. About 16-32% of by catch are thrown away into the sea. In the “food value chain”, because of the tight specifications (such as size, blemishes and appearances) in supermarkets, about half of the harvests are thrown away. Most waste are produced at manufacturing and processing because of trimming off of edible portions such as skin, fats, crusts from food. Other reasons are over production, product damage and technical difficulties (Bloom, 2011).